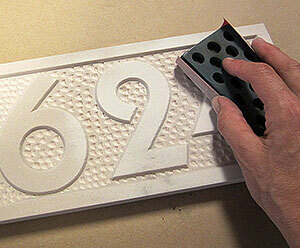 Doing a bit of carving is a great way to add an entirely new dimension to your Make-it-Yourself Plaque. 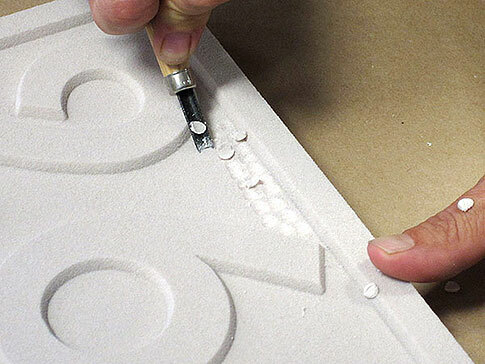 Atlas creates your Make-it-Yourself Sign from High Density Urethane Sign Foam (HDU). HDU, a type of plastic is a marvelous product that will not rot, attract insects, or crack. But, for this technique the important characteristic of HDU is that it is easy to carve. Easier than wood because it has no grain to send your tool off into uncharted territory. 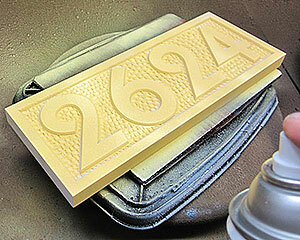 One of the options available for the uncoated Make-it-Yourself plaque that your receive from Atlas Signs and Plaques is “Raised Lettering” This means that the numbers, letters, and text stand out from the background. When you receive your Raised Lettering Uncoated Plaque, your numbers etc will stand about 1/8 inch above the background which will be flat. That is where your options begin. 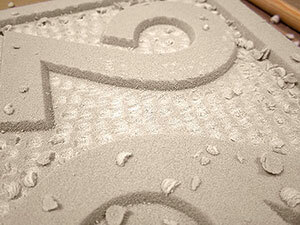 You could carve out the back ground deeper and make the letters stand out in greater relief. Or, as in this case, provide a decorative pattern to the background. HDU carves very easily, so modest quality tools will suffice. They are readily available in hobby stores, hardware, or big-box home stores. It is so easy. Just use a carving tool in the shape or shapes you desire and go at it. The example on this blog only took a few minutes and was done using an inexpensive curved carving tool. When all is done to your satisfaction, paint away. Since sharp tools are being used a couple of safety hints are in order; 1) Sharp tools are better than dull tools. 2) Be aware of what is in front of your tool. If it slips you won’t want it heading off into your free hand, or someone else’s body parts. 3) Always assume that the tool will slip. Let Atlas do the heavy lifting by forming the sign shape and cutting the design, then you apply the custom touches that you want making your DIY sign truly yours. This entry was posted in DIY on February 26, 2014 by AtlasSigns.